Like many other toys the first Slinky was a mistake. In 1945 the U.S. Navy commissioned Richard James, an engineer, to make a device that would hold their navigational instruments level in rough seas. He thought that some combination of springs would do the job. He was wrong, After trying hundreds of different combinations he apologetically told the Navy that he couldn’t invent what they wanted. He was cleaning out his work space when one spring started to fall from a top shelf. Instead of just hitting the floor however it began to walk it’s way down. First to another shelf, then the desktop, onto a chair and finally to the floor where it gathered itself back together again. James tried to make it do the same thing again and much to his surprise it did, over and over it accomplished it’s remarkable walking down feat. Excited, he rushed home to his wife who put it through her own set of tests finally trying it on a set of stairs where it really showed off. He told his wife that he just had to find some scientific use for the spring but she just smiled and told him that he had just invented the newest toy sensation. and that was exactly what was needed. After the demo they sold out of the 400 Slinky’s they had made and by the early 1950s they were mass producing the little toy and selling thousands per month. One key to the success was the couple’s desire to make the toy accessible to poor children. They set the price at $1.00 and fought hard to try and keep it there. The first Slinky’s were made of blue-black Swedish steel. 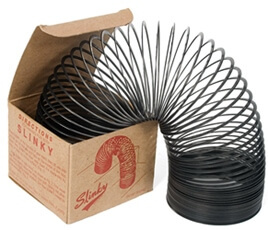 When Slinky’s went into mass production less expensive American steel was used. Each standard size Slinky contains about 80 feet of wire. The Slinky was used as an antenna for field radios during the Vietnam war. It takes 10 seconds to manufacture a Slinky on today’s assembly lines. Slinky’s went to space aboard the Space Shuttle to test the effects of zero gravity on springs. The Slinky was inducted into the National Toy Hall of Fame in 2000. It was also named to the Toy Industry Association’s “Century of Toys List”, a roll call of the 100 most memorable toys of the twentieth century. Many different styles of Slinky’s have had their shot at fame but the original remains the top seller. 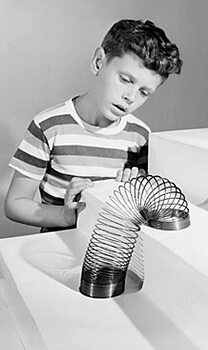 In 1952 a Washington State woman sent the Jame’s an idea for Slinky pull along toys. She sent design ideas and drawings along with the suggestion. Production began on the pull toys, the Slinky Dog and the Slinky train. Richard and Betty James were such honest people that the woman who sent the idea received royalty checks from them for between $60,000 and $70,000 a year for seventeen years.